NEW YORK – As artists, we all wish that our carefully selected portfolios and painstakingly written emails to art galleries may some day be considered, or even looked at. At Camel Art Space we decided to not only consider every submission we received, but to put our favorites in a group show all their own. We are therefore proud to offer Cordially Yours, a group show of 7 artists selected by Camel Art Space from portfolio submissions received over the past year. ‘Cordially Yours,’ ‘Kind Regards,’ ‘Sincerely Yours,’ ‘Best Regards’…These are the closings to the letters we received for requests to be considered for showing in our exhibition space. Before these endings were written, the writers revealed their hopes and aspirations to be part of an artistic scene of emerging peers. To be selected out of a multitude of artists all vying for that same spot on the wall; to be given an additional stile up the ladder of their artistic careers is every artist’s ambition. Even though the chance ratio of getting selected by galleries through online submissions is rather slim, it has still undoubtedly become a standard practice for many to keep sending out their work for consideration anyway. At Camel Art Space, we feel it a dutiful part of our programming to look at submissions and try to do something with them. 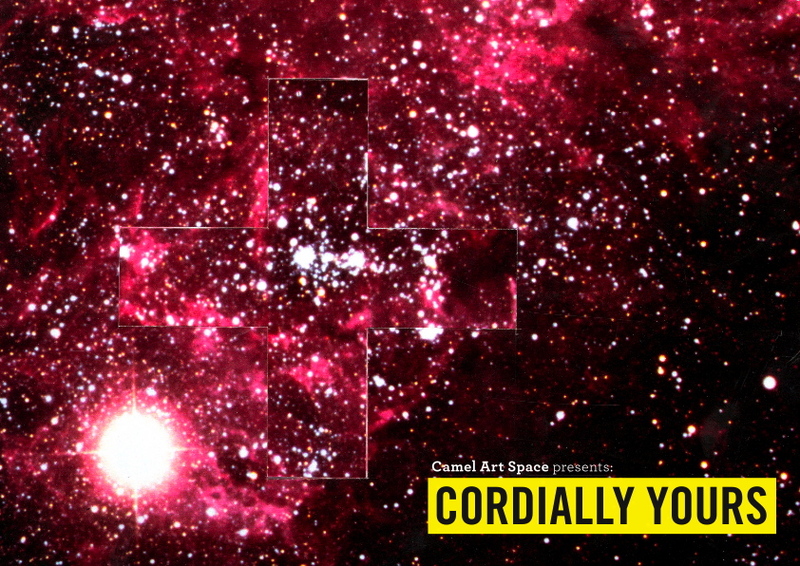 Last year we invited everyone who had sent work for consideration to participate in our group show On the Grid. This year we decided to make a careful selection that amounts to an exhibition of discoveries of national and international emerging talent. Tom’s collages are born through a process of shuffling colors, glueing, and tearing paper, the results of which are pictorial simulacra: images appearing as both what they are and what they are not. The balance of forms, created from magazine clippings and found photographs, seems to simultaneously depict a collection of cut paper pieces and a landscape, a sculpture, a portrait photograph, a note left on the table. His work primarily deals with the illusion of space and the reorganization of structural cues. The arrangement of parts form new structural macrocosms, each of which contains varied traces of the originating source material, as well as the premise for a new whole. Additionally, the interplay of textures, and the pairings of disparate parts, serve to heighten the depth of the work and underscore the deceptiveness of simplistic appearances. Tom Engel was born in Albany, NY in 1980, received his BFA from SUNY Purchase, NY and currently lives in Brooklyn. Dominik Halmer deals with one basic question in his work: What is the reason for making a painting? Respectively: How can one deal with the overload of the surrounding world? One approach is to follow the idea of organizing the chaos and imbalance of a world that constantly forces one to act. The painting grows while attempting to explain or depict abstract coherences, processes, situations in life. A vocabulary of symbols and signs is set up. Dominik Halmer was born in 1978 in Munich Germany, studied at the Academies of Fine Arts in Dusseldorf and Vienna and lives and works currently in Berlin, were he directs Bureau Adelbert, an artist operated exhibition space. Monika’s recent series of paintings consists of large scale watercolors on paper depicting various wreath-like arrangements made of bacon. Most of them are symmetrical and somewhat reminiscent of the Rorschach ink blot test. She combines the formal elegance of design with the recognizable banality of bacon, along with the surreal and absurd accompaniment of other decorative elements such as flowers, butterflies, and fruits. The arrangements are playful and whimsical in a rococo fashion but also grotesque. Her not-so-still still-lifes, are drawing subtle parallels between the decadence and frivolity evident in certain historical genres and our contemporary culture. Monika Malewska was born in Warsaw Poland. She received her BFA degree from the University of Manitoba in Canada and her MFA degree from the University of Texas at San Antonio. William’s work is about painting symmetrical and geometrical forms. Compositions are carefully considered, typically they incorporate themes of architecture and straight-lined objects. At times he utilizes collage-making techniques to create his own compositions and in others works simply unaltered photographs are portrayed. Throughout O’Neill displays his underlying concern with accuracy and rigidity in the finished work. The austere approach portrays a different sense of security and intimacy between indoor and outdoor spaces. More recently some of his paintings use urban settings as a focal point with an underlying theme of transport. Wiliam O’Neil received his BA in Fine Art Painting, N.C.A.D. and lives and works in Dublin, Ireland. Joey’s drawings close the perceived divide between Fine Arts and Illustration. His seemingly immaculate technical approach, following a preconceived serial concept, allows for a world of refinement. “I draw with simple materials—an average office gel pen or traditional quill pen and ink—which allows me a quick, direct approach when exploring ideas, and clearly displays the thought and work that goes into each image. I believe it’s important to show my process—the viewer should be able to see how the images are constructed, including the inevitable mistakes and experiments that comprise my creative thinking. Joey was born in Ohio in 1982 and studied at Kent State University in Kent OH. He currently lives and works in Bushwick, Brooklyn. The series of video works in this exhibition examines the unclear boundary between physicality and virtuality; as the files are brought from one format to another, information is lost in the saving and compression of images, and the files disintegrate as their source code is disrupted. Jillian Ross recently graduated with her BFA from the Drawing and Painting program at the Ontario College of Art and Design. She currently lives and works in Toronto and co-directs the online 3D art gallery Barmecidal Projects. Liam’s art explores the convergence of contemporary science and ancient myth in the attempt to apprehend what we cannot articulate within the core dilemma claimed by the role of the visual artist in representing the unrepresentable. Erik Davis wrote in his book TechGnosis that we are a “hypertechnological and cynically postmodern culture seemingly drawn like a passel of moths toward the guttering flames of the premodern mind”. Taking cue from this statement, Liam’s sculptural work investigates a speculative future-past at the permeable boundaries between nature and technology, belief and science, myth and machine. He exercises an imaginative realm once reserved for parable and fable. Liam was born in Ottawa in 1989. He received his BFA from the Ontario College of Art and Design University and he currently lives and works in Toronto. Camel Art Space is an Artist operated exhibition Space with a focus on current issues in art within a not for profit work frame, is a member of Williamsburg Gallery Association and is participating in 2:nd Friday Art Walk. Situated in one of New York’s artistically richest neighborhoods we strive to provide an accessible exhibition platform and meeting venue for artists, curators and audience alike.